This large Clovis point was discovered in April, 1988 during the excavation of the East Wenatchee Clovis site. The site is located in central Washington in Douglas County. It was found laying next to three other large fluted Clovis points at the edge of an ancient pit that contained more than 60 stone and bone Clovis culture artifacts. 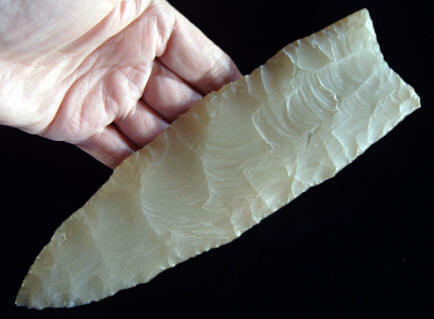 It's believed that this Clovis point has been resharpened one or more times. This point is made of a very pure, translucent clear to white agate that may have been quarried from outcrops among Columbia River basalts east of the archaeological site. It measures 5 5/8 inches (22 cm) long, 2 9/16 inches (6.6 cm) wide and 1/2 inch (1.2 cm) thick.